When we moved into our new house last May, Spring had already consumed our small, quarter-acre lot. The azaleas in the front were in full, brilliant bloom–an explosion of pinks and reds and whites that distinguished our home from all others along our quiet street. In the back yard, where our property line kisses the Goucher College woods that extend deeply, well beyond any vanishing point discerned even by the tallest of rooftop dwellers, early-summer greens greeted us, a curtain of colors rich in nature’s hues. A few deer, rumored to be part of a population exceeding 200, were in our yard grazing as we did our best to silence our grunts, lugging box after box from our hatchbacks and minivans. To put it simply, we were enveloped by nature’s childhood quilt, so young, so new, so alive. Autumn’s demise has left us with a different view of our yard. For the first time, we can see the dead azaleas once covered by the other, thriving bushes. And in the back yard, we have learned that there are no evergreens. The Goucher woods are completely deciduous, and it takes little effort to see completely through the bare branches to the other side of the woods, where the hustle and bustle of campus living is still in full swing as students prepare for finals. When you stand still at the fence that separates civility from the wild, the faint rustle of the remaining leaves clinging to the brittle branches finds you, whispers to you, that even in all its dulled grays and browns, an energy remains that cannot be whistled away by the coming winter winds. The deer seem unaffected by all of it, though; they come and go as they have all year, bringing a sense of calm to the community. In these woods, we are reminded of the things that are most important. And in these same woods, soon the hunters will walk. Last week, Goucher announced that an aggressive campaign would be launched to “thin the herd” of wild deer on the campus grounds (you can read the carefully worded press release here). According to Maryland’s Department of Natural Resources, the size of the campus grounds can provide a healthy habitat for 40 deer. A deer kill of 160 over several years seemed to be the logical solution, not taking into consideration the births of two fawns per doe (on average) every year. MDNR and Goucher president Sandy Ungar agreed on an initial hunt of about 50 deer soon after finals conclude. I am reminded of several literary works where a society functions on a strict management of its community and its population. The Story of B, the sequel to Ishmael by Daniel Quinn, addresses this issue in a disturbing way where he writes about people as a food source. Ungar, who has talked about the importance the deer have to the entire Goucher community, using words like “family” when he talks about them, follows his comments with how the meat of the deer will be donated to homeless shelters. I find this both disturbing and somewhat cannibalistic that he would suggest enjoying the deer’s presence on the Goucher grounds to create a more friendly and natural collegiate setting. But every year or so, we’re going to slaughter 25% of that family and share their flesh with those who are hungry. This is the problem, though, when we interfere with the natural life cycles of the animals that are native (or once were) to our region. We don’t manage the lives of rabbits or squirrels. We don’t need to; there are larger animals to take care of any concerns of overpopulation. We’ve scared off the bigger predators, though, and because the deer remain very high on the food chain, we’ve created an unfortunate situation where we want to keep them around for their cute factor, as long as we assume the role of their predator. Goucher is not unique. Several companies in and around Baltimore have welcomed deer herds on to their land for the natural and caring image they bring to their corporations. Eventually, though, slaughters are scheduled there as well to “manage” the herd. We can’t have it both ways. The Goucher president was wrong when he commented sarcastically to a local paper that we’re not dealing with a bunch of “Bambis” on campus and that the general population shouldn’t view them as such. We’re not doing any animal a favor by providing a nice, secure habitat for them solely for our conveniences, only to hunt them down and kill them when they’ve procreated to sustain the existence of their species. In the meantime, I have to figure out what I’m going to tell my children when they see the hunters in the trees, just on the other side of the fence, the one separating civility from the wild. I don’t envy you having to explain this to your kids. I am not opposed to this type of animal control. The disturbing of their environment has happened and won’t be reversed and there is a degree of cruelty to allowing a species to thrive past the point that the environment can support them, but it seems like there could be a better way to do it and a better way to present it to the community. What?!?! This is absurd (at least to a city/suburban) dweller like myself who can’t imagine killing anything ever….can’t they capture them and take them somewhere and release them? My heart is sad for this. Deer meat tastes good and it is going to feed people who may otherwise go hungry. All animals serve a purpose for us on earth…players leaving your home team via free agency, now that is a tough thing to explain to a child….. I LOVE that photo. Even in the vast woods where I live, it’s rare to see a buck like that one! I used to share Michelle’s viewpoint until I moved to a remote area bordered by woods. The deer herds are ridiculous. They stand in the road as if they own it; I’ve had to WAIT for them to decide to get out of the way just to drive down my own road. They eat ALL of our azaleas unless we put up hideous electric fencing around the front of our house. Both my husband and I have hit deer on our own street while driving below 30 mph, because they dart out of the woods with no warning. 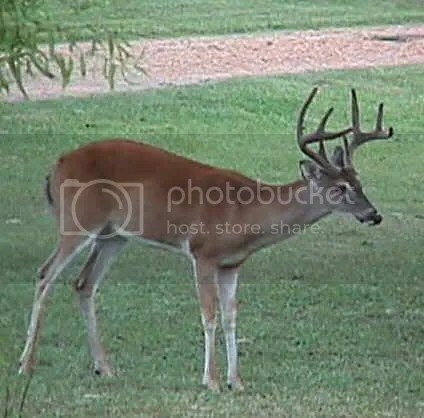 Though I’m well past the fascination with deer being cute, I still love the photo you got of a majestic buck! !